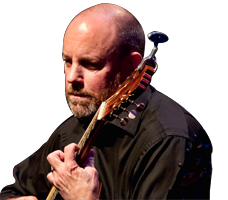 Damon Buxton is an American contemporary classical acoustic guitarist and composer. He uses silent spaces, open tunings, natural reverb, and double picking to create a beautifully sparse and resonant sound, playing through the air without pickups, effects, or electronic assistance. He delivers an uplifting and engaging solo guitar performance with positive humor and grace. After a 2007 release produced in collaboration with Windham Hill Records founder Will Ackerman, he built his own studio and set about recording some of the world ’s most intimate acoustic guitar recordings. Damon has performed at Kirkland Performance Center and Bastyr University Chapel in Seattle, The Mattress Factory in Pittsburgh, and other performing arts centers throughout the US. His latest solo guitar recording, The Golden Age, was released in January 2019 and is available at DamonBuxton.com, iTunes, Amazon, and everywhere popular music is sold.